*Based on the prices of other paintings in the series and adjusted for inflation and value appreciation. 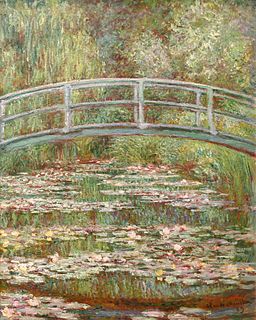 Pond of Water Lilies (1899) is one of about 250 paintings in Monet's water lilies series. In 1893, the impressionist painter bought a property in Giverny and turned it into an Eastern-inspired garden. The centerpiece of the garden is a water lily pond with a Japanese footbridge over it. Monet produced numerous canvasses of the pond at different times of the day and from different perspectives. These paintings might have been influenced by Monet's fascination with Japonism -- a strong interest in Japanese arts and culture that was popular in Europe during his time. Monet himself had several prints of Hokusai's Thirty-Six Views of Mount Fuji in his possession. The Dutch painter Van Gogh shared a similar interest in Japonism. Although many of Monet's paintings are horizontal or square-shaped, Pond of Water Lilies (1899) is more vertical allowing us to observe the depth of the pond. Colorful water lilies are plentiful and water reflections are clearly visible. The interweaving of greens and golds, combined with red-color strokes, suggests the setting of the painting is in middle or late afternoon (during summertime or in early autumn). Monet demonstrated a mastery of textures. We could see the Japanese bridge's minor degradation, while the plants and trees behind the bridge have smoother textures.